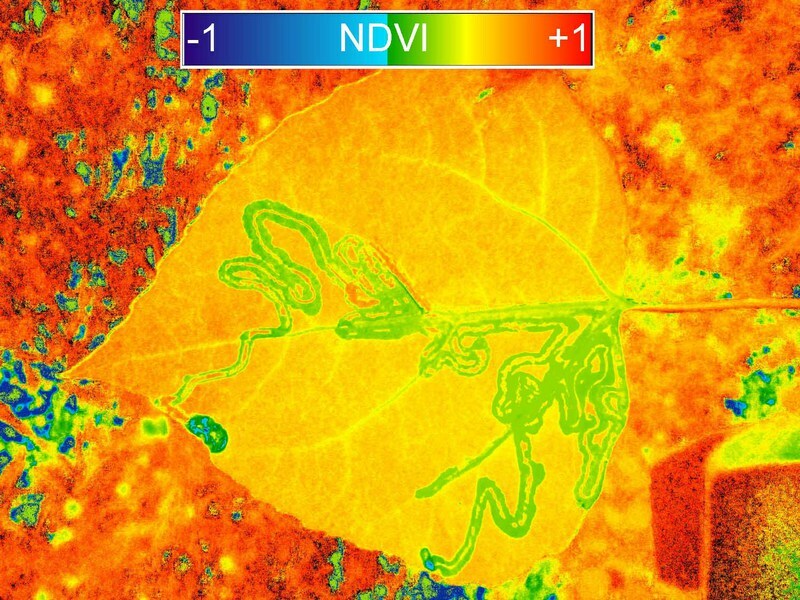 Image above: Infrablue NDVI image of quaking aspen leaf with larval mines of the aspen leaf miner. 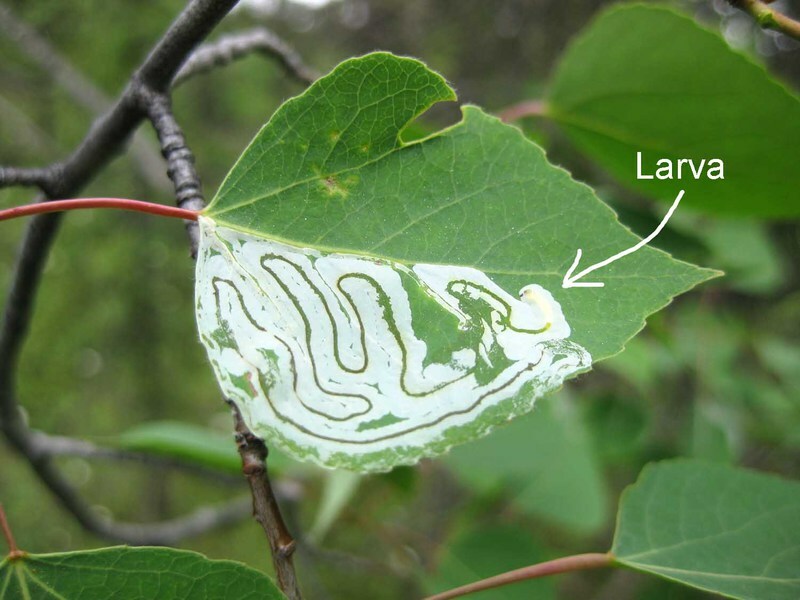 In the last decade, 3,000,000 acres in Alaska have been affected by leaf damage to quaking aspen trees (Populus tremuloides) caused by the aspen leaf miner (Phyllocnistis populiella). The flattened moth larva feeds on leaf tissue between the upper and lower leaf surfaces, reducing photosynthetic activity and causing early leaf drop. Mining trail of an aspen leaf miner larva with the larva at the end of the trail. The aspen leaf miner is a native species which is known to irrupt periodically. For the last several years, groves of aspen trees throughout Interior Alaska have appeared grayish tan from a distance because of extensive damage to leaves. Although the trees' ability to make food via photosynthesis was reduced, most trees survived the multi-year irruption. It appears that the recent outbreak has ended and damage is returning to normal levels. Infrablue NDVI image of quaking aspen leaf with larval mines of the aspen leaf miner. Infrablue photos were taken with a modified Canon A810 with a Rosco #74 filter. The camera was custom white balanced on a piece of blue origami paper. Hi Chris, Have you already written in detail exactly how to do white balancing (up close, or in context with landscape in background, or how? ), and what kind of blue paper we need? This will need some more observations, but it should enable everyone to get started. It's easy to experiment!